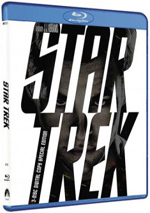 Another day, another collection of high-definition Trek! 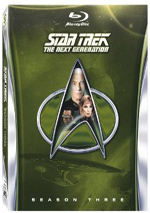 This package includes all 26 episodes from the third season of Star Trek: The Next Generation. If you want my detailed synopses and thoughts about the whole year from my 2002 DVD review, please click right here. Season Three became the period in which TNG forged its own identity. While the first two years had many good moments, they came with some dogs, too. That problem doesn’t occur here, as the show achieves a significantly higher level of consistency and hit its stride. Storylines flowed more naturally and the characters generally seemed more believable and less forced. It’s a very nice collection of episodes. As was the case with the Season One and Season Two Blu-rays, S3 boasts newly-created visual effects. As mentioned in those reviews, this was done because the live-action material was shot on film but the episodes were finished on video, so those effects wouldn’t translate to high-def. Season 2 encountered some controversy, as the effects weren’t as high-quality as those for S1. I thought they looked okay, but I couldn’t argue they were as good. Happily, the quality returns to S1 levels with Season Three. The new effects suit the material well and look nice. 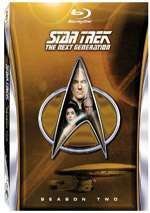 Star Trek: The Next Generation appears in an aspect ratio of 1.33:1 on these Blu-ray Discs. I liked the presentation of the first two years, and Season Three looked even better. Sharpness seemed strong. Occasional softness appeared, but that appeared related to the source, particularly in effects shots; those could be a little “off”. However, that was unavoidable, and the majority of the material looked tight and concise. No issues with shimmering or jagged edges occurred, and I noticed only mild edge haloes. Print flaws weren’t a factor, as the shows looked clean. TNG favored a warm, earthy palette, and those colors looked nice here. The hues came across as full and rich. Blacks appeared tight and firm, and low-light shots offered fine clarity. Without question, this was the best TNG ever appeared. One footnote about the transfer related to Disc Four’s “Sins of the Father”. That episode appeared on the Next Level sampler that came out in January 2012. At that time, the disc’s producers were unable to locate the original film for 13 seconds of “Sins” so they had to upconvert that section from the old video. For the S3 Blu-ray, they found the material, so those 13 seconds now came to us in all their high-def glory. I’ve always enjoyed the series’ DTS-HD MA 7.1 soundtracks, and S3 continued that positive trend. Actually, the mixes might get better as the years progress, as I thought this one was a bit better than what I heard for the first two sets. The soundscape opened up matters nicely. Ships flew accurately around the room, and the track created a good sense of general atmosphere. While never an action-oriented series, TNG managed occasional fights/battles, and those came across as involving and convincing. The five speakers delivered a solid feeling for those elements and brought us into the action. Audio quality held up well after more than 20 years. Speech rarely betrayed any edginess or problems, as the lines remained pretty natural and distinctive. Music was lively and full, while effects seemed accurate and full; no real distortion marred the proceedings. I felt pleased with the audio heard here. How did the Blu-ray compare to the original 2002 DVDs ? I felt audio was more dynamic and full, while visuals were radically improved. The Blu-rays seemed cleaner, tighter and more vivid. This was a tremendous change for the positive. “The Bonding”: writer Ronald D. Moore and scenic artists/Trek archivists Michael and Denise Okuda. Moore dominates this one, as he discusses his early interest in Trek, how he came to the series, this script and aspects of his work on the show. The Okudas toss in some good notes, too, but this is Moore’s baby, and he makes it an enlightening look at the inner workings of the series. “Yesterday’s Enterprise”: Moore, Michael and Denise Okuda, and writer Ira Steven Behr. While the Okudas throw in the usual info about technical elements, the two writers dominate and make this another enjoyable chat. We get specifics about the episode as well as thoughts related to the series’ writing process and the show’s connection to the franchise. The track moves well and becomes a winning discussion. “Yesterday’s Enterprise”: director David Carson. Previously found on 2008’s Fan Collective – Alternate Realities, the director chats about staging and scenes, the script and complications related to Whoopi Goldberg’s availability, sets, lighting and other changes made for the “alternate reality” of the episode, and a few other production issues. On the negative side, Carson goes silent a little too often. However, he still manages to provide quite a lot of good info about the episode in this solid piece. “The Offspring”: Michael and Denise Okuda and writer Rene Echevarria. Expect a track similar to the one for “Bonding”, as we learn how Echevarria came to the series as well as aspects of the script/story and connected elements. As usual, the Okudas give us some notes but mostly faciliatate and help evoke details from Echevarria. He gives us many nice insights and creates an enjoyable commentary. “Sins of the Father”: Moore, Michael and Denise Okuda, and visual effects supervisor Dan Curry. Despite the addition of Curry, Moore dominates this chat ala the one we heard earlier. Heck, even when the discussion veers into some technical areas, he still leads the way; Curry offers a few effects notes but doesn't participate a lot. The Okudas chime in with their own info but usually act more as moderators and let Moore run with it. That's fine, as this becomes another informative piece. Disc One’s Mission Overview offers a pretty general look at the ways the show changed between Seasons Two and Three. 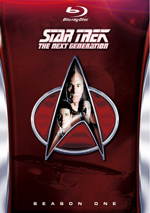 During this 17-minute and 41-second program, we hear from executive producers Rick Berman and Michael Piller, associate producer Peter Lauritson, visual effects supervisor Dan Curry, production associate Eric Stillwell, and actors Denise Crosby, Patrick Stewart, Gates McFadden, Wil Wheaton, Jonathan Frakes, Brent Spiner, Marina Sirtis, LeVar Burton and Whoopi Goldberg. The interviews mix sources from 1989, 1994, and 2001-02; in a nice touch, the subtitles indicate the date of the material. ”Overview” does what its title indicates, as it provides a broad look at the variations seen during Season Three. This means we hear about some crew changes - particularly the introduction of executive producer Piller - plus the return of McFadden and Frakes’ ascension to the director’s chair. The participants offer some general comments about the year as well and focus on a couple of particular episodes. The material provides some decent production notes, though we’ve heard a couple before, like the reasons for Goldberg’s desire to be on the show. Overall, “Overview” seems interesting but not particularly revealing or deep. Disc One opens with ads for ST:TNG - The Best of Both Worlds and Star Trek: Enterprise Season Two. All of the package’s shows come with Episodic Previews as well. When we shift to Disc Two, we locate Selected Crew Analysis. It runs 13 minutes, 51 seconds and includes comments from writer/producer Ira Steven Behr, executive producer Piller, and actors Stewart, McFadden, Wheaton, Frakes, Sirtis, and Burton. This show gives us a decent little look at the characters, especially the ways in which they grew between seasons. Among the highlights, Stewart addresses the complacency into which Picard started to fall and his attempts to fight that, while Burton mentions some frustrations he felt about the treatment of his character. It’s a nice little program that provides some good insight into the cast and crew viewpoints of the roles. Next we go to Disc Three’s Memorable Missions. This 13-minute, 25-second program concentrates on anecdotes that relate to specific episodes. It goes over seven of the 26 shows and includes interviews with make-up designer Michael Westmore, music editor Gerry Sackman, executive producer Piller, and actors Stewart, Sirtis, Burton, and Ethan Phillips. We hear a lot of entertaining notes here, as we get details about a variety of elements. Obviously it lacks great coherence since it jumps from episode to episode, but it gives a reasonable amount of worthwhile and fun facts. More fun shows up with Disc Four’s Departmental Briefing: Production, which gives us a good take on a number of technical issues. During the 20-minute, four-second piece, we hear from executive producer Piller, production associate Stillwell, visual effects supervisor Curry, scenic artist supervisor Mike Okuda, actor John De Lancie, model maker Greg Jein, senior illustrator Rick Sternbach, music composer Jay Chattaway, and production designer Richard James. They address a number of topics, from writing challenges to score concepts to effects improvements. The program offers a brief but engaging examination of these areas. The remaining extras are new to the Blu-ray. Disc Five gives us In Memoriam: David Rappaport, a five-minute, seven-second tribute to the guest actor. Rappaport worked on the “Most Toys” episode for two days but couldn’t continue due to an attempted suicide and the role was recast. (Rappaport would again try to kill himself – and succeed – in May 1990, right before “Toys” aired. Here we see the material he shot during his brief stint on the series. It’s interesting to view this unused footage. A Gag Reel goes for eight minutes, 37 seconds and concentrates on the usual fare. We see the actors flub their lines and act silly. If that appeals to you, have fun! Disc Six throws in another memorial with A Tribute to Michael Piller. It lasts 13 minutes, 50 seconds and gives us notes from Behr, Stillwell, Echevarria, Frakes, Moore, Livingston, Spiner, wife Sandra Piller, son/Dead Zone executive producer Shawn Piller, and executive producer Brannon Braga. We get some thoughts about Michael Piller, who passed in 2005. It’s a good look at the man, especially because it doesn’t totally wallow in sentiment. With Inside the Writer’s Room, we get a one-hour, 10-minute, 52-second documentary. Hosted by Seth MacFarlane, it gives us a roundtable discussion with writers Naren Shankar, Rene Echevarria, Ronald D. Moore and Brannon Braga. They talk about how they came to Trek, thoughts about colleagues and the atmosphere on the series, story/character topics, episode specifics and other topics related to the show. Some of the information repeats from elsewhere, but not a lot, and the format becomes fun. Whatever one thinks of MacFarlane, he knows his Trek and his presence adds to the chat. The writers interact well for a lively, occasionally irreverent discussion of the series from the writer’s POV. Finally, we locate Resistance Is Futile: Assimilating Star Trek: The Next Generation. All combined, its three parts fill a total of exactly one hour, 30 minutes and we hear from Behr, Echevarria, Berman, Moore, Stewart, Stillwell, Spiner, McFadden, Sirtis, Crosby, Dorn, Frakes, Wheaton, Burton, and executive script consultant Melinda Snodgrass. “Futile” looks at feelings toward the first couple years, the operation of the script/writing process and the impact of the producers, the development of story and characters, episode specifics, cast and performances, photography and visual design, and general thoughts about Season Three. The first two parts of “Futile” focus almost exclusively on the writers, which means they threaten to feel… not redundant, but a little stale, as we’ve already heard so much from that side of the series. This isn’t a negative comment about those parts of the discussion; I just started to worry that we’d get no other perspectives from the Blu-ray’s exclusives. Happily, Part 3 opens things up well and gives us a broader viewpoint. Parts 1 and 2 are quite good, too, especially since they dig into some conflicts and controversies; even though we’ve gotten lots of content from the writers, they add new info. Part 3 expands horizons and lets us view Season Three from the actors’ side. All of these add up to a strong program. They say the third time’s the charm, and the third season of Star Trek: The Next Generation was clearly the strongest of the first three. It offered the series’ highest level of consistency to that point; along with the usual roster of excellent episodes, we found almost no genuinely weak ones. The Blu-rays gave us terrific visuals and audio along with a strong set of supplements. TNG fans should be delighted with this package.